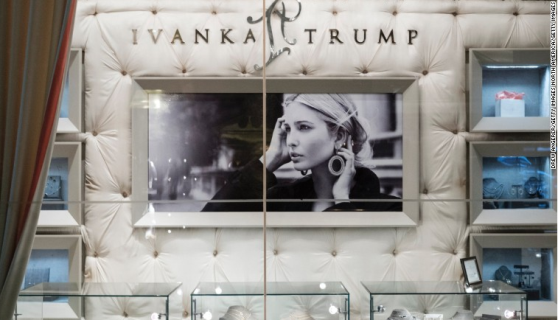 Last night, Abigail Klem, president of the first daughter's brand of companies, confirmed to The New York Times that Ivanka Trump Fine Jewelry is being discontinued. Instead, the company will focus its efforts on costume jewelry, with a more accessible price point. The fine jewelry line, whose website featured black and white portraits of Trump modeling her pieces, encompassed rings, bracelets, pendants, earrings and necklaces. On the high-end is a woven diamond necklace for $19,500, and the lower side, a simple rose gold ring with a price tag of $940. The demise of the fine jewelry line shouldn't necessarily be viewed as a failure -- in retail, it's much more difficult to sustain a select number of expensive "special occasion" pieces than it is to mass market more affordable fake gems. Klem told The New York Times that the brand is now committed to "offering solution-oriented products at accessible price points." In January, Ivanka Trump announced she has stepped away from leadership of her corporate roles, both at her brand and her job in the Trump Organization. Though she still has a financial stake in her brand of companies, she said she's turned her focus to building a new life for her family in Washington and serving as informal adviser to her father.